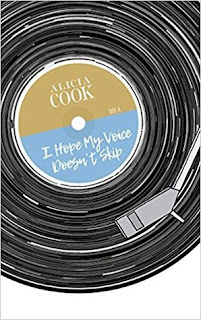 Bestselling writer and activist Alicia Cook returns with I Hope My Voice Doesn't Skip, a collection of poetry, prose, and song. The follow-up to Stuff I've Been Feeling Lately contains anthem-like poems about relationships, mental health, current social issues, and learning from loss, with the promise that recovery is possible. The reader's experience with this unique collection is lifted from the page as Cook has collaborated with a number of up and coming musicians to transform some of her poetry into song. Like her debut book, this one is divided into two parts. Modeled after a vinyl record this time, the collection is separated into the EP record, holding Cook's shorter poetry, and the LP record, holding Cook's longer poetry, prose, and songwriting. Together, they form an inspiring collection for all those recovering from something. I have recently been neglecting my blog due to exams so I decided to write a couple of reviews to make sure I have a post for every week of the exam period. given reviews are my favourite posts to write I have a few lined up. I've been wanting to read her other book for a while so when I saw this on netgalley I knew I wanted to read it and I think this is the best poetry book I've read this year. I was crying at some of them and while this book wasn't life changing, I definitely want to buy the finished copy of this. In conclusion, this was a amazing poetry collection which will really speak to people and is a very safe choice if you want to buy someone a present. I'm going to give this 4 stars.